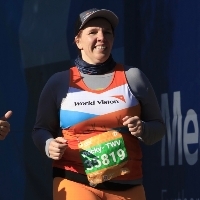 I am super excited to be running in the World Vision Global 6K for Water! On May 4, 2019, I will be joining thousands of others around the globe to run 6k and provide clean water to children in communities around the world. I would love for you to either register for the Global 6K alongside me or make a donation to my fundraising page. For $50, World Vision can provide an individual with clean water that lasts! World Vision works with communities in desperate need to help provide things like clean water, nutritious food, education, medical care, and economic opportunity.